Ten new stops have been penciled in on Bublé’s calendar for the month of July, bringing the singer coast-to-coast to hit cities like Los Angeles, New Orleans, Chicago, and New York! Bublé! airs March 20 at 10:00 p.m. on NBC. Singing sensation Michael Bublé had some exciting news for fans this week, announcing plans for an all new tour set to kick off in early 2019! The 27-date “Don’t Believe the Rumors Tour” will launch February 13 at Tampa, Florida's Amalie Arena. From there, the “Feeling Good” crooner will go on to hit the stage in cities like New York City, Philadelphia, Chicago, Dallas, and Los Angeles. A final performance at the Tacoma Dome in Tacoma, Washington will bring the curtain down on April 6 before Bublé heads to his homeland of Canada for the remainder of the tour. 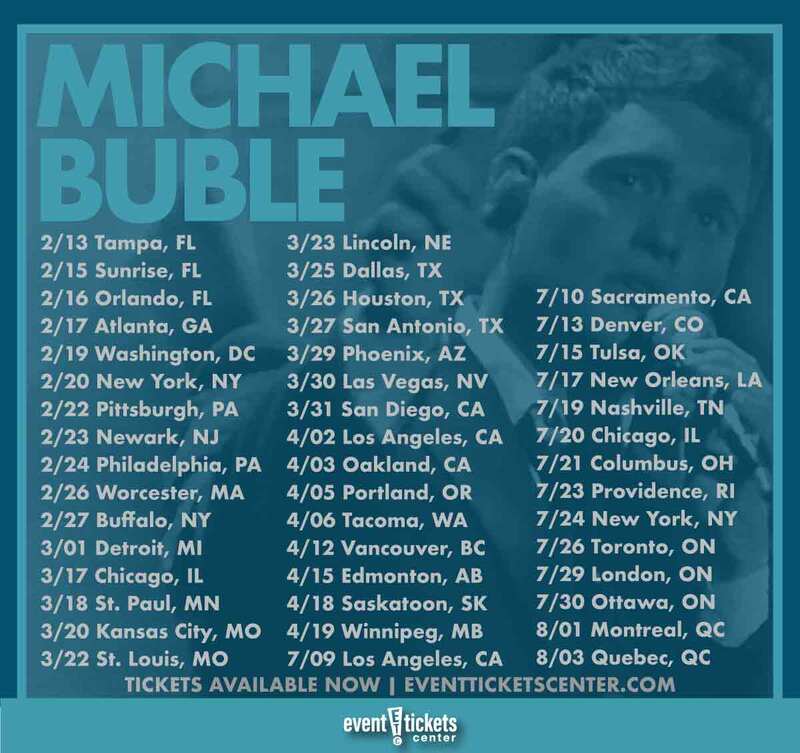 “Don’t Believe the Rumors” marks Bublé’s sixth time touring and will be in support of his tenth studio album, Love. It will also serve as his first time back on the road since taking a hiatus from music after his son Noah was diagnosed with cancer in 2016. Love (stylized as a heart emoji) is due for release on November 16, the same day Bublé will be receiving his very own Star on the Hollywood Walk of Fame. With his charming disposition and silky-smooth vocals, Michael Bublé took the music world, breathing new and vibrant life into genres that had fallen to the wayside in the wake of ‘90s boy bands and electro-pop. 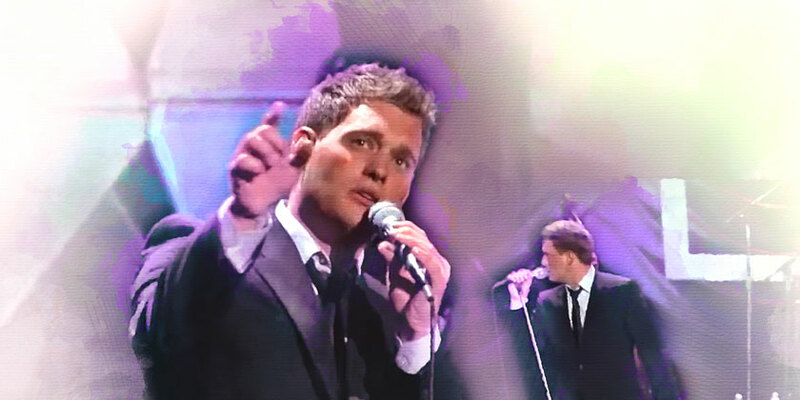 Influenced by classic singers like Frank Sinatra and Tony Bennett as well as modern artists like Harry Connick, Jr., Bublé stepped onto the scene at just 26 years old, believably selling old-school jazz standards, swing, and adult contemporary pop tunes alike. Bublé’s self-titled breakthrough album debuted in 2003 to worldwide commercial success, topping several charts around the globe and going on to earn a multi-platinum certification. The album’s success was only a sign of things to come, as he continued to release one chart-topping album after another over the course of the next decade, including It’s Time (2005), Call Me Irresponsible (2007), Crazy Love (2009), Christmas (2011), To Be Loved (2013), and Nobody But Me (2015). After years of non-stop recording, touring, and award-winning success, Bublé announced he would be taking a step back from the spotlight for some time after learning his son Noah had been diagnosed with cancer in 2016. Two years later, the singer finally broke his silence in September 2018 with the announcement of his tenth studio album Love. Bublé remains a top-talent and one of the biggest names in the music industry, even with a two-year long hiatus behind him. For many, his voice and music have become synonymous with Christmas time and the holiday season. Over the course of his 20+ year career, Bublé has earned four Grammy Awards, 13 Juno Awards, and sold over 75 million albums worldwide. Where is Michael Bublé playing near me? If you have ideas for articles or categories we aren't currently providing, feel free to drop us a line.